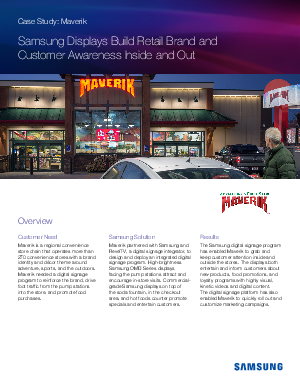 Maverik partnered with Samsung and RevelTV, a digital signage integrator, to design and deploy an integrated digital signage program. High-brightness Samsung OMD Series displays facing the pump stations attract and encourage in-store visits. Commercialgrade Samsung displays on top of the soda fountain, in the checkout area, and hot foods counter promote specials and entertain customers.